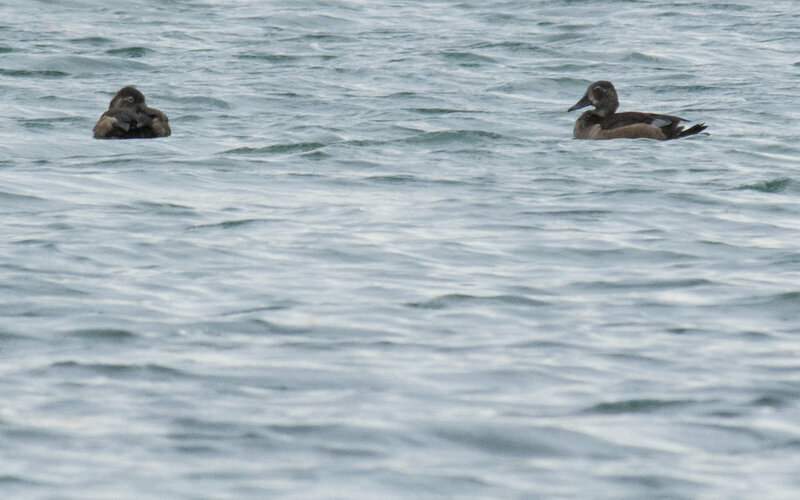 In the first one (Oct 19)) I am reasonably sure the one on the right is a Blue-winged Teal (although no previous sightings at this particular location), but I am learning not to be too confident. If so is it an immature male - finer plumage detail on sides and distinctive crescent, but no white hip marking? The second one (Nov 6) may be a red herring. Sometimes I just take a series of images of the local ducks and check them later on the computer to see if anything interesting was there. I didn't notice the duck at the back (out of focus) at the time and it has been puzzling me since. I suspect it may be a trick of the light although the colors are correct in the image. I just looked more closely and it appears to be rolling over explaining the white sides but still a lot of white on a reddish head. All suggestions and comments appreciated. The two ducks in the first photo appear to be Ring-necked Ducks (notice the peaked heads and solid backs). 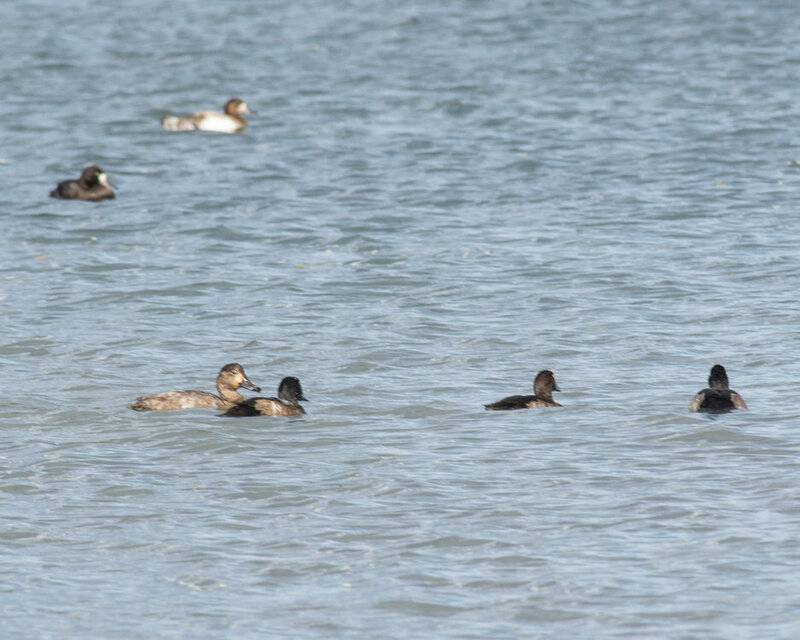 In the last photo I think there are mostly Scaup (Greater is my guess) with a Redhead at the left of the group in front. I suppose the two ducks on the right could be Ring-neckeds, but I can't tell (maybe someone else can!). I'm not sure about the duck in the back. Thanks again Bird Nuts. What was confusing me was the blue and blueish white markings on the wings/tail which stand out clearly on the dark back. I had not noticed this on a Ring-necked previously, but maybe the lighting. The one at the back of the second image will probably remain as one of life's mysteries. The back duck in the bottom photo appears to be a scaup rolled onto it's side for grooming. I can see a yellow eye on one of those foreground ducks, without an eyering. That is likely a scaup also. I was wondering if we were seeing a belly or under a wing.